The lynching of Will James. 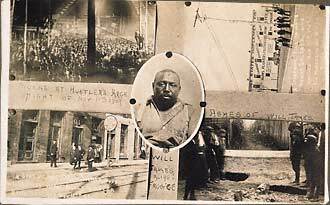 Composite photo, Will James portrait in center and three scenes of his lynching. in top right corner the lynching site of Henry Salzner, lynched the same night as Will James. November 11, 1909, Cairo, Illinois. Gelatin silver print. Real photo postcard. 5 1/2 x 3 1/2"